In this post I quickly go over the use of HeaderAttributes to help you keep the inspector clean and easy to work with. And finally I explain how you can hide or disable inspector properties based on a bool field within your script. Lets take a look at the following example inspector window. Notice that with even a small script like this it can already be difficult to get a good idea of what is going on. What we would like is the ability to group our fields in a way that makes sense for the designer. Making it very clear what the role is of the different variables within the functionality of my script. This can be done with HeaderAttributes. Simply add the attribute in front of your public field and you are good to go. 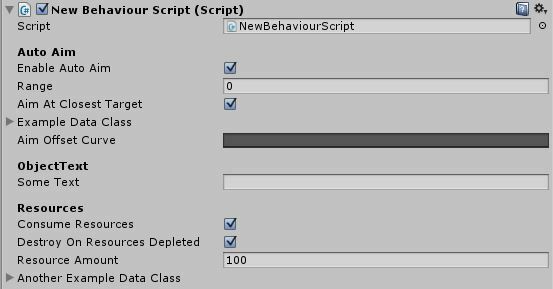 A simple, quick and super effective way to instantly increase the readability of your script within Unity’s editor. Unity provides a series of additional attributes that can help you in managing the look of your script within the inspector and how the user can interact with them. All without having to write special inspector specifically for this script. Some useful and commonly used attributes to look into are the space, tooltip and range attributes. Using HeaderAttributes is all shiny and cool but what if we want to help the designer even further? 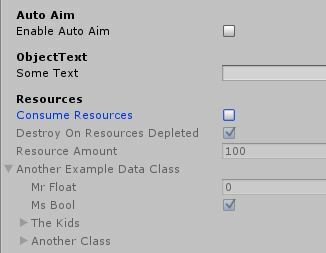 In this example most of the properties under the Auto Aim category will only be relevant when EnableAutoAim is set to true. Say that, to avoid confusion and to keep our inspector nice and clean, we want to hide all the properties that are directly related to the EnableAutoAim if this property is set to false. Or instead of hiding them, we want to at least disable them, preventing user input. To make this possible we need to create a custom attribute and matching PropertyDrawer. I’m not going to go into the details on how PropertyDrawers and Attributes fully work. For that I will point you towards https://unity3d.com/learn/tutorials/modules/intermediate/live-training-archive/property-drawers-custom-inspectors. But I will go over the logic and setup of this specific PropertyDrawer and attribute. Lets get started 🙂 . As mentioned we are going to need 2 scripts: ConditionalHideAttribute and ConditionalHidePropertyDrawer. Important to note is that the ConditionalHidePropertyDrawer needs to be placed inside an Editor folder within the project and the ConditionalHideAttribute scripts needs to be located outside this folder. Otherwise you will not be able to find and use the attribute. First we create our Attribute. We want to be able to define a bool Field that will be in control of the hiding/enabling of the inspector properties and we also want to be able to choose between the hide and enable options. The ConditionalHideAttribute inherits from the PropertyAttribute class and is nothing more than a simple data class with some constructors. The main purpose of this class is to provide additional data that will be used within the PropertyDrawer. If you want to add extra options/ parameters to this attribute, this is where you would add them. The AttributeUsage attributes used at the top of the ConditionalHideAttribute class control where you will be able to use this attribute. In the PropertyDrawer we need to do a couple of things. In order to check if the property should be enabled or not we call GetConditionalHideAttributeResult. Using our newly created ConditionalHideAttribute is fairly straightforward and works much like the HeaderAttribute. Leaving out the second parameter or setting it to false draws the property using the enable/disable method. This being Unity after all there are a few situations where this custom attribute will fail. The first situation being Lists and arrays. In those cases the property drawer will be applied to the content of the list but not on the list itself… . You will still be able to adjust the number of items as well. However when the List is part of a Seriazable class everything will behave as expected. Why is this you ask? Because Unity, that’s why. Another situation where the use of this attribute will fail is when being combined with different property drawers that change the way the property itself is being drawn such as the TextAreaAttribute. This makes sense as this attribute performs his own OnGUI drawing and GetPropertyHeight calculation of the same property. The attribute that is called last will be the attribute that determines what is being drawn in this case. Added support for 2 bools instead of only 1. You can use this option by simply adding the second ConditionalSourceField as parameter. Based on a suggestion by @VeevTSG via Twitter I have added support for object references to be used as a condition. You can easily extend the code to add additional condition checks such as integers, floats, strings, etc. Added support for conditional property hiding in nested/encapsulated serializable objects that are used as inspector properties. Thanks CrashOverride for the great addition in the comments!! The downloadable file and article above have both been updated with the new addition. It has been a while since I updated the source for this so I have added some functionality that is part of the current iteration that I’m using in my day to day work. Added the option to inverse the results of the different ConditionalSourceFields individually as well as inverting the full end result of the conditional check. Added the option to use a logic OR check instead of a logic AND check. Added the option to define ConditionalSourceField arrays (both for the properties and per property result inverse bool). This will allow you to have as many properties as you want to be considered for the hide. I hope this post was off some use and be sure to let me know if it was :). Very useful, have you found a way to make it work alongside [Header] and other custom PD? It should work just fine with any attribute that doesn’t directly alter the property visualization itself. So things such as tool tip, space and header will behave as expected. Unfortunately I haven’t found a way to automatically combine custom PD’s. This sort of thing would be extremely useful for my project. However, I am writing it entirely in JS and would need to convert these scripts into JS for them to work with my scripts. Is that even possible? I am having a hard time trying to find the JS equivalent lines online. Would you be able to point me towards the Unity Script Reference if it exists? Well, I’ve been able to successfully convert the scripts into JS, but the ConditionalHidePropertyDrawer is having a hard time getting the attribute from the ConditionalHideAttribute script, giving me a null reference exception error when I have the object I wish to use this attribute on selected. Any words of wisdom? I’ve got the script in the Editor folder and even tried directly grabbing the attribute through Resources.Load via its script. Technically, as far as I know, you could even keep the custom propertyattribute in c# within the project and still use it inside of your JS scripts with the @ symbol. But I could be wrong on this one. Thanks for your response. While I wasn’t able to get the converted JS scripts to function correctly I did end up realising that I could just use the C# scripts. I haven’t had much experience with having the two languages work together in Unity so I just assumed it was safer to convert it. I’ve grabbed the attribute with the JS syntax and it all works as it should. It seemed to work for Max. Thanks for the quick reply. I just tried that but sadly it doesn’t work. I opened a question on Reddit/r/Unity3D that explains the issue a little better with the exact code I typed. I found this very useful, thanks. For my own purposes I have extended it to test against floats/ints/and array size. It defaults to test these as > 0 but I also added TestValue public fields which can be specified to test against instead. I cannot find a way to make it hide arrays properly, OnGUI appears to never receive the actual array property only the individual elements… stupid unity. Unfortunately there is indeed no clean way to hide arrays. Well… it will hide everything except the index count 🙁 . So far I haven’t found a way to work around this and I’m not sure if there is. It does hide custom data classes though, so an array wrapped in a custom serializable class will hide as part of the class. But that’s a bit to hacky and overkill for my taste 🙂 . Nice to see you were able to extend it to fit your needs. I personally also have a variation that allows you to hide based on enums etc. But for those I usually just create a completely new attribute to avoid adding to much functionality to the base ConditionalHideAttribute implementation and making it to overloaded/complex to use. Thing is serializedObject seem to always refer to the root were the variable exist, therefore being problematic when using subclasses. Thx for the great addition CrashOverride ! Updated the article and downloadable file with the fix/upgrade. Thank you so much! Absolute lifesaver. Am I free to use this script in an asset? Ps: any way I could use this on enums? As for the enum. Enums are actually just integer values so this will not work out of the box just like that. I do have an alternate version of this system that works with enums and allows me to hide properties based on the value of an enum. Below is the code for that. You could easily combine the 2 and create different variations but for our use it works just having both version. How can I make multiple attributes work alongside each other? public float GizmoColorAlpha = 0.25F; //Opacity. As far as I know this is currently not possible with PropertyDrawers in Unity . I wish it was. You can however stack decorator attributes as they don’t change the visualization of the data. // Draw the property as a Slider or an IntSlider based on whether it's a float or integer. I wanted to be able to add some more complex logic so I made a quick extension with reflection that let’s you check properties (that unity can’t serialize). This is just a simple enum example, but you can do any combination of logic. Big thanks to you! Your script make my variable in inspector more clean and beauty! Hope you will share more knowledge about Unity! In case someone is using things and can’t build their project, in C#, you should wrap the PropertyDrawer in a #if UNITY_EDITOR region. Is it possible to have one true and one false? Sorry for the late response. It seems something went funny with my mail notification settings. The order doesn’t matter. And yes you can have one true and one false, with some minor code changes. I actually added this in my current version of the script. I shall see if I can find some time to add the updated version later this week. Great work. Its been very handy for me. Currently I am trying to hide a list from the inspector but using this method, the list seems to be unaffected. Do you know of a way to hide a list entirely not just is elements? I have tried to solve this a number of times but so far have had no luck in finding a solution. It annoys me and well and seems to be a limitation of Unity and attribute drawers. A somewhat nasty workaround is to wrap your list/array in a custom data class as those can be be fully hidden/toggled. To avoid the maintenance nightmare, use `nameof(MyProperty)` instead of `”MyProperty”`. This way you can rename your properties safely and they update accordingly instead of just not working anymore without telling it. Hi Guy and Brechtos I have Update! Since it can’t hide the array and lists, is there any replace solution for suggestion? Unfortunately so far I have had little luck with this. At least to have a solution that is clean and robust. The only think you could do is wrap your list inside of a helper wrapper class but that always feels so …well …meh for a lack of better words. If you really want to give it a go you will need to analyze the path of your property, detect that it is pointing to a sub object of an array and then point to the parent array object for hiding as well. That is what I got working but then just reverted that solution as it was causing other issues for me. The array and list issue is something I have learned to live with until perhaps I can find the time to give it another go.